JONATHA BROOKE'S "MY MOTHER HAS FOUR NOSES"
One of the most revered singer-songwriters to come out of the emerging female singer movement of the late 80s, Section 101 client Jonatha Brooke has taken on a new project, the very personal Broadway musical "My Mother Has Four Noses". After raising funds for the show via a PledgeMusic drive, Jonatha work-shopped the play and began performances this summer at the Warner Theatre in Torrington, CT. The show will make its Broadway debut at The Duke on 42nd Street Theatre in New York City on February 14th, 2014. 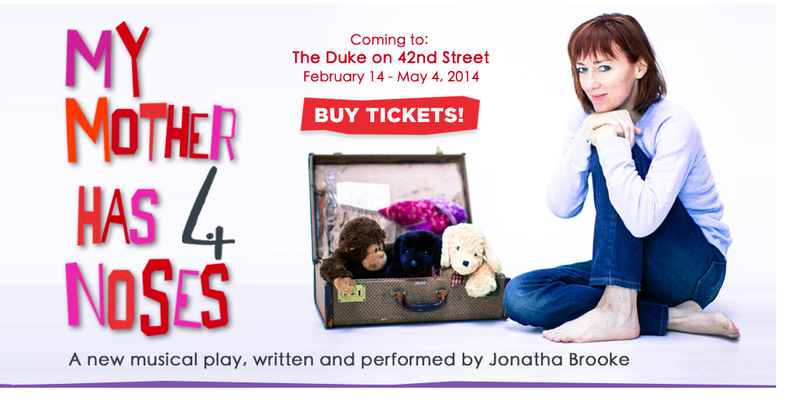 You can buy tickets via https://www.dukeon42.org/. If you just can’t wait to hear some of the amazing music Jonatha’s written, she will beperforming selections at New York City’s 54 Below . For more on the incredible moving "My Mother Has Four Noses", visit https://www.4noses.org.